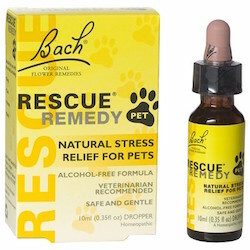 Alcohol free Pet Rescue Remedy works wonders for animals that are impatient, fearful, has been through a traumatic situation, have fear of thunder and fireworks or do not feel themselves. Directions: Place 4 drops of Rescue Remedy on a treat and offer to your animal. Alternatively add 4 drops of Rescue Remedy to drinking water. Repeat as required. Safety Information: Warnings: Keep out of reach of children. Keep away from eyes. If symptoms persist, please consult pet's healthcare practitioner. Ingredients: Active Ingredients: HPUS 5X dilution of Helianthemum nummularium, Clematis vitalba, Impatiens glandulifera, Prunus cerasifera, Ornithogalum umbellatum. Inactive Ingredients: 80% glycerine, 20% water.